Paper Craft for Kids! Kooool! 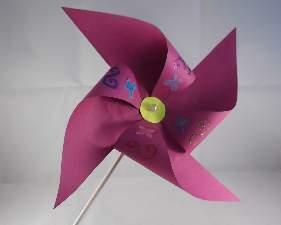 Paper craft for kids should be first of all easy and do-able, also fun. Any craft as it happens, should be enjoyable. Take into consideration the time scale. A short project is best for a younger child. They should be able to achieve the end result before they loose interest. Now let`s get our thinking caps on! Here is one real easy project when you know what to do. The wind toy will always be around, and what`s more? You don`t have to wait on the wind to spin it. 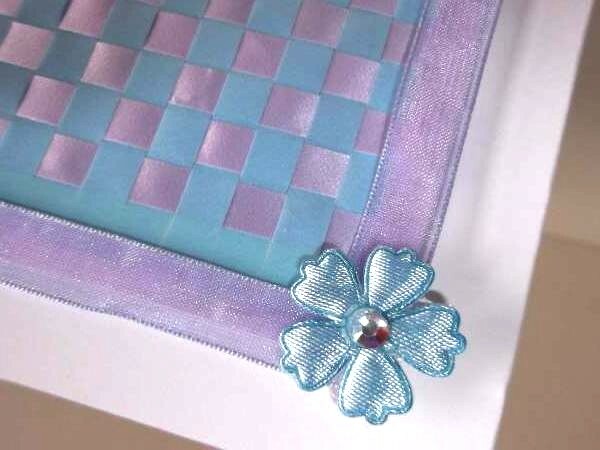 Checkered paper weaving is a very versatile craft. Use it to put a special touch to cards, make a mini gift basket, or show off some shiny scales on a fishy picture. Sky`s the limit with these paper weaving projects! For older kids you can present more challenging projects but keep in mind that they need encouraging comments when it doesn`t go quite so well. If they detect any criticism they will drop everything and abandon the activity and you will find it hard to get them interested again. Iain, James and I were arranging a garden party, so we thought it would be nice for them to make some of the decorations and invites. We thought party bunting would be a nice and easy paper craft to work on. They got together with a friend and between them they took turns in cutting out and attaching the flags to the string. The end results are effective and bright. Some children might find making bunting too difficult. In that case you could suggest paper chains. The next project the boys worked on was party invitations which they designed on the computer, printed out, and then added some glitter, as a finishing touch to set them off. I remember I gave them a little project to do about a year ago using Paint in Microsoft Windows. James was just 4 then but was amazed to see what he could create with the mouse and Paint tools and then print out the hard copy. According to him it was awesome! 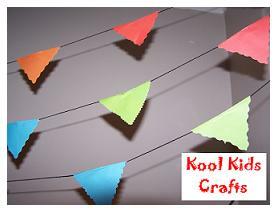 See how they go about making kids party crafts which includes invitations and party hats. Kids Party cabin has great kids party ideas for ages tots to teens. Each party theme is packed with fun party games, food, decorations and activities to ensure you give the perfect kids party. Next year comes around pretty quick these days, so here`s a paper craft for kids that can fit in with winter days indoors. Make a calendar for mum and dad, grandma and grandpa, or anyone you have in mind. Here is a cute idea! Mini cards to represent each month. What you put in them is up to you. So get cracking and make your calendar ready before the new year comes around. I wonder how many of us have ever tried our hand at paper mache. If yes how did you find it? But look! What are these strange hanging objects??? My first attempt was in primary school. The project took a few weeks of art classes to complete but every step was interesting and enjoyable. We made puppet heads, painted them when dry, and then attached the body and sleeves. That project has stayed with me all those years. It`s a great project for kids to get stuck into. It`s nice and messy and gives free reign to their creativity. During the summer school holidays, making a paper mache puppet is one of the items on our summer workshop agenda. That`s what these strange objects are above. Keep posted to see how we set about making them. 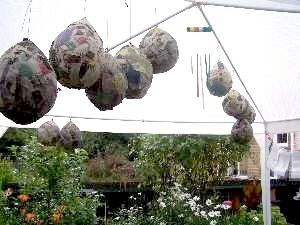 In the meantime, see some of Karen`s creative paper mache for children on the Kid`s zone page. 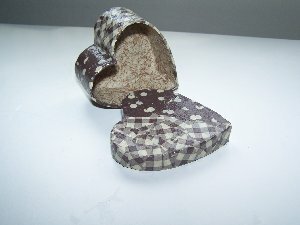 While we are on the subject, have you heard of Decoupage? That really appeals to older children form 7 upwards. Adults love it too! You can decorate your own paper mache models or ready made ones that you buy in kits, ranging from animals to ornamental gift boxes. To put it simply, you paste colorful paper onto your model until it`s covered and varnish it over. The paper that comes with these kits are stunning in design. 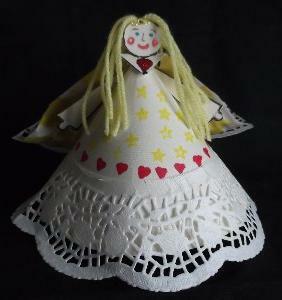 It`s a paper craft that`s a big hit with hobbyists and catching on fast! Paper is wonderful! It is so versatile when it comes to creating what`s in the imagination. Children are great at working in groups. A kid`s collage will inspire them as they work together. To make a collage you will need paper with various textures, colors, and weight. Adding friends and family from photos is another smashing idea. Cutting out heads and drawing in the bodies is hilarious and will cause a few giggles. They look really stunning on bright days. Display all your work by creating a window gallery right there at home. They are not too hard to make using a simple design or a more elaborate one, the process is the same. 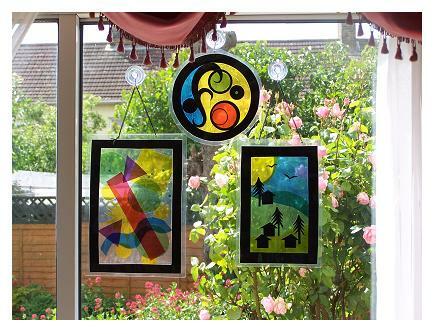 But you will need access to a laminating machine if you want to make stained glass suncatchers KKC style. They are our own original paper craft for kids! For the more adventurous child you have the art of origami (Japanese paper folding). 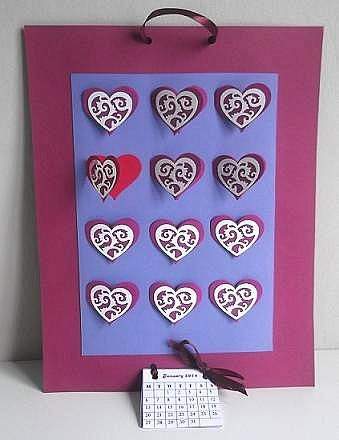 This can also be a simple paper craft for kids that can help them to develop patience and precision. There are some very interesting kits around based on safari or zoo animals. 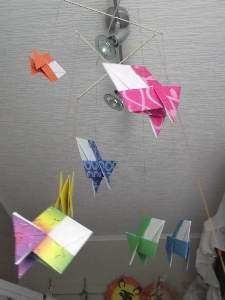 Here is a fish mobile you can make using origami models. The paper print designs can bring the imaginary animals to life, encouraging the artists to add to his collection. Boys do like the paper airplane kits a lot, some come with stickers and pilots to sit in the cockpit. Before spending hard-earned money on a kit which can be a bit steep, try getting them to practice on some copy paper which is quite good for origami. I doesn`t tear easily when folding, just cut it to a square. After they have had a few practice sessions then you will know if it`s worth your money to buy them the real thing. This little princess is made from a paper plate. If you have often wondered what to do with your left over party paper plates, this clever little pattern will have you churning out princesses by the dozen.